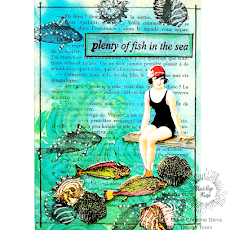 Hello Peggy here to show how I put together some fabulous background stamps using Sin City Stamps and Green Sneakers Kreate-A-Lope Envelope Template. Below is an envelope using the clear embossing powder on black to create a tone on tone effect. I used a background stamp. Where the stamp didn't quite reach the edges of my envelope I used a texture stamp and stamped randomly around the edges. Since my background stamp was vertical I made a few adjustments to my template to create an envelope that opened at top. This is where I changed it up a bit.. I punched two holes and inserted two eyelets and threaded my twine for a closure. I taped up the two side flaps. I may use this technique for a future envelope mini album. Here is the same stamp as above. Only using clear embossing powder on a white sheet of paper. I distressed this white paper with distress inks. Then wiped my image clean to reveal awesomeness. This envelope below shows how I used the same stamp again for the background. My background stamp is not wide enough for this horizontal envelope, so I decided to stamp half on one side, half on the other and the entire stamp in the middle. I love how not all of the stamp made an impression. Where I had any lines to distinguish where my stamp started and ended I used a texture stamp to fill in the spots. And last but not least .. an embossed focal image using the tone on tone effect with only clear embossing powder. The other images for the background were only using versa mark ink without embossing powder which gave me another tone on tone shade. Sin City Stamps you can't go wrong! your own envelopes and have as much fun as I did! I love your envelope projects, and especially the first one where you turned it into a top opening style. These templates are quite versatile, and with the Sin City Stamps to decorate them, they make for a fabulous combination.